Slab pies – like our Peach Blueberry Slab Pie – aren’t only fun to make; they feed a dozen or more, whereas your average 9-inch round pie feeds about eight. First make sure to chill your dry mixture and your butter a good hour ahead. Mix the dry ingredients, and put them in the freezer. Cut your cold butter into 1/2-inch cubes, put them on a plate, and refrigerate for an hour. While you’re at it, get out your 1 cup glass measuring cup, fill it to the 1/2 cup mark with cold water, and refrigerate that too. After an hour you’ll be ready to proceed. Even though the mixture is crumbly, it can be packed like the clumps on the left. Now gather and pack it all very loosely and put it in a 1-gallon plastic freezer bag, slightly off center so it favors the sealed edge opposite the side that opens. Fold over the open edge, to make more of a rectangle, then take your rolling pin and roll the pastry right in the bag out toward the edges. This will square off the sides of your pastry and make it easier to roll the rectangular shape you need for the pan. Refrigerate the pastry for at least one but preferably 2 hours. Here’s the dough in the bag, below. 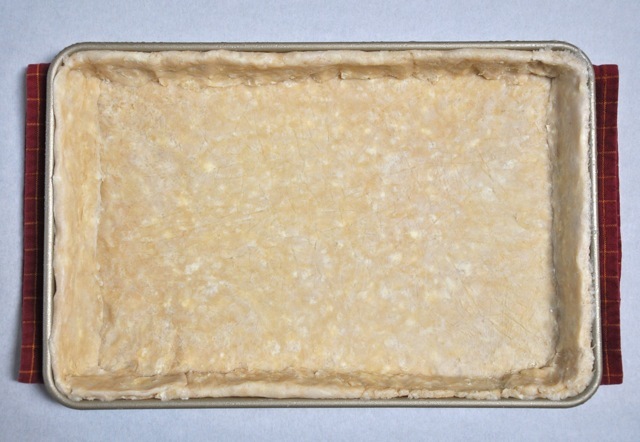 After an hour or two, you’ll roll the dough into an 18-inch by 13-inch rectangle. Make sure your kitchen is cool before you start rolling. I’ll actually adjust the thermostat 30 minutes ahead to lower the temperature in the kitchen so it’s good and cool. Cut the bag with scissors to remove the dough. Roll it on lightly floured wax paper, between two sheets of plastic wrap, on a well-floured surface or parchment – whatever method you’re used to and works best. Then line the pan with the dough. Don’t worry if you need to do a little patchwork here and there: you’ll never see it after the pie is baked. Trim, sculpt, and pinch the sides so they’re flush with the top of the pan. When you’re all set, put the pan in the refrigerator for an hour. Longer is fine. Now you’re all set to fill and bake your pie. Good luck. Cut the cold butter into 1/2-inch cubes and put the cubes on a plate. Refrigerate the butter for 1 hour. There's no need to cover it with plastic. Put the 1/2 cup cold water in the fridge, in a 1 cup spouted measure. When you're ready to proceed, transfer the dry mixture to a food processor; pulse once or twice, to mix. Remove the lid, scatter the butter over the dry mixture, then pulse the machine about 10 times, until the butter is broken into small pea-size pieces. Gradually - in about a 10-second stream - pour the water through the feed tube, pulsing the machine as you add it. When all the water is added, continue to pulse until you have small, uniform crumbs. Stop the machine before the crumbs start clumping or gathering around the blade in a ball. Dump the crumbs into a large bowl and pack/gather them lightly. 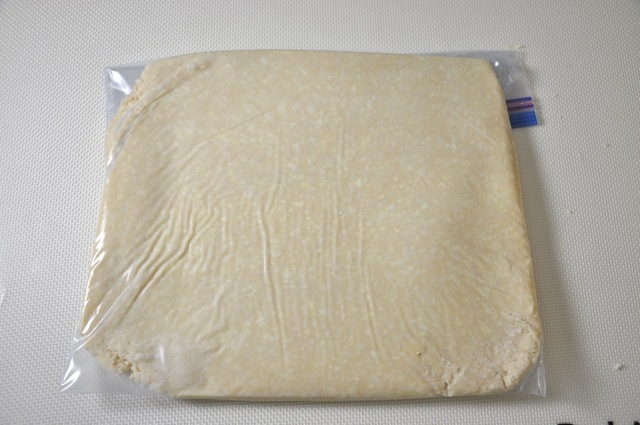 Place the dough in a gallon freezer bag, fold over the open edge to make a large rectangle, then roll the dough toward the edges to square up the sides. Place the bag in the fridge for 1 to 2 hours; longer is fine. When you're ready to roll, cut the bag open, remove the dough, and roll the dough into an 18- by 13-inch rectangle on a floured surface. Line the pan with the dough, keeping the edge of the dough flush with the top of the pan. Refrigerate the shell for at least one hour before filling and baking. Makes one large slab pie shell. NOTE: To make the dough by hand, proceed as above but only chill your ingredients for about 30 minutes. (If everything gets too cold, it's hard to cut in the butter.) 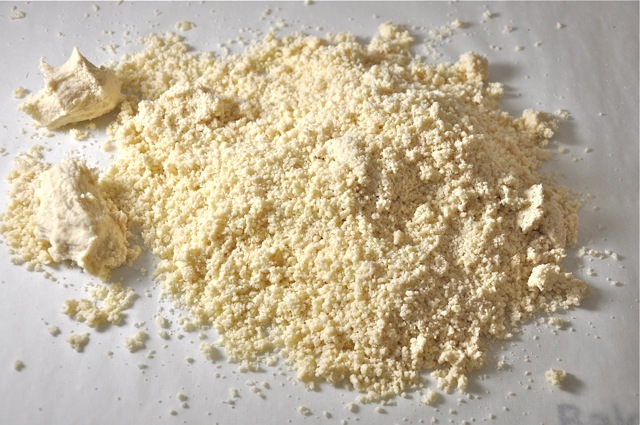 Using a pastry blender, cut the butter into the flour until your butter is broken into small pea-size pieces. Sprinkle on half of the water and lightly mix it in with a fork. Repeat, adding the remaining water 2 tablespoons at a time. Add additional ice water as needed - 1 teaspoon at a time - tossing and mixing the dough until it forms crumbs that hold together when pressed between your fingers. Gather the dough and proceed as above.